On September 22nd 2011 in Monaco, Harry Winston is taking part in the Only Watch charity auction organized by the Monaco Association against Muscular Dystrophy (AMM), under the Patronage of HSH Prince Albert II. 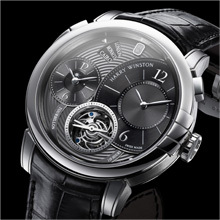 Keenly aware of the gravity of this pathology and eager to affirm its commitment to children, Harry Winston has developed and produced for this exceptional event an exclusive Grande Complication model: the Harry Winston’s Only Watch 2011 Midnight GMT Tourbillon. This fourth edition of the Only Watch auction will feature an exceptional array of unique models made by 40 of the greatest watch brands. After two months of a world tour, the auction will be held in the Principality of Monaco on September 22nd 2011. It will be orchestrated by the internationally renowned horological auctioneers Antiquorum. Harry Winston senses particular affinities with this event with which it has been involved since the first edition in 2005. By supporting research on Duchenne muscular dystrophy, a neuromuscular disease that affects 250,000 children worldwide, Harry Winston confirms its commitment to childhood and to life in general. Loyal to the spirit and the legacy of its founder, the House is indeed involved in a specific philanthropic effort through the Harry Winston Hope Foundation and makes a yearly donation of at least 5% of the company’s pre-tax profits to support education worldwide. This year, Harry Winston has chosen to dedicate an exclusive model from the Midnight collection to the Only Watch operation. Right at first glance, the Midnight GMT Tourbillon asserts its claim to a place within the select circle of Haute Horlogerie. While preserving its own personality, this unique piece bears the genetic imprint of a brand that has imposed its unique and innovative style on a centuries-old industry. 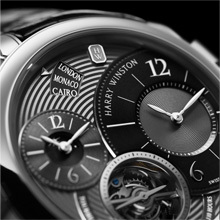 It incorporates many of the iconic Harry Winston signature features. Topped by a bezel discreetly bearing the three distinctive arches of the Harry Winston’s New York Salon, the case is crafted in platinum exclusively for Only Watch. Its 45 mm diameter magnificently frames a mechanical bidirectional automatic movement. Endowed with a 110-hour power reserve, the mechanism drives the horological complications appearing on en eminently masculine ruthenium dial. The tourbillon positioned at 6 o’clock carries the small seconds display, while the GMT display at 9 o’clock is enriched with a day/night indication. The 11 o’clock aperture indicates the cities representing the second timezone, including Monaco in tribute to the Only Watch event. The alternating finishes accentuate the urban and sophisticated spirit of a model brilliantly combining horological tradition with the legendary Harry Winston creativity. 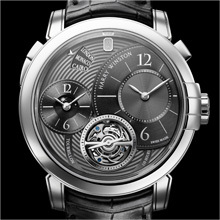 The Harry Winston’s Only Watch 2011 Midnight GMT Tourbillon mingles design and technology to offer a resolutely contemporary vision of time. The pure, finely balanced elegance of this unique model dedicated to a noble cause will doubtless appeal to collectors of fine watchmaking and who appreciate exceptional craftsmanship.